Silhouette Artist Karl Johnson Is Returning to Fiddlesticks! 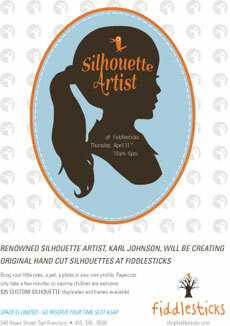 We're thrilled to announce that silhouette artist Karl Johnson will be returning to Fiddlesticks for a second visit. We hosted him last year, and all day long happy parents went out the door with beautiful, hand-cut silhouettes of their children (and a few pets, too!). Silhouettes make unique gifts to keep or to share with grandparents and other loved ones, and Karl is truly a master. Join us Thursday, April 11 between 10 a.m. & 6 p.m. - call us at 415-565-0508 to reserve your space! Each appointment is five minutes only: Karl works extremely quickly, so bring on those wriggly, giggly little ones!